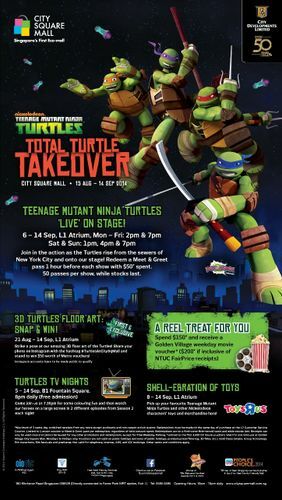 It’s a Total Turtle Takeover at City Square Mall! The Teenage Mutant Ninja Turtles will rise from the sewers of New York City and hit the stage at City Square Mall in an all-action experience! Look forward to meeting the Turtles – Leonardo, Raphael, Donatello and Michelangelo – join in the action as they share some tips they have learnt from Master Splinter. Be ready to get up close and personal in a Meet & Greet session by redeeming an exclusive Meet & Greet pass with a minimum spending of $50. Terms & Conditions apply. 2. 3D Turtles Floor Art: Snap & Win! Snap a photo with the unique Teenage Mutant Ninja Turtles 3D Floor Art, shown for the first time and exclusively at City Square Mall. Strike a pose and share your photo on Instagram with the hashtag #TurtlesAtCitySqMall and stand to win $50 worth of Metro vouchers! Only 20 winners will be selected, based on the creativity of your photo and the number of likes garnered. Join us every evening at 7.30pm for some colouring fun and then catch two episodes from the second season of the Teenage Mutant Ninja Turtles series on a large screen with your family for free! With every $150* spent ($200 if inclusive of NTUC FairPrice receipts), stand to redeem a Golden Village weekday movie voucher. Terms & Conditions apply. Featuring renowned hotels and bakeries from around Singapore including Shangri-La, Orchard Hotel, Marina Mandarin, Regent Singapore, Mandarin Orchard and Bakerzin; everyone in the family can get to savour their favourite flavours at the Mid-Autumn Fair! Bring home a Teenage Mutant Ninja Turtles memorabilia from an extensive range of toys and stationery in a Toys’R’Us merchandise fair. There’s bound to be something for all! Be entertained by the melodic sounds of the 22-member strong Singapore Wind Symphony City Swing (SWS City Swing) who will perform on 23 August, as well as the 10-member Percussion Ensemble who will perform on 24 August. Listen out for familiar jazz classics and popular movie themes!